This failure seems simple enough – one of the engines is low on oil pressure; the checklist reduces thrust and shuts down the affected engine. Then there’s the reality of dealing with an engine NNM under various conditions of high altitude and high thrust settings. This failure has something of a history in 777 simulator training. As candidates (and instructors) encounter the failure after the first instance, there’s a tendency to “over think” and become somewhat inventive in how it’s handled. Let me explain. In the simulator this failure is typically given at high altitude to add the complication of the requirement for an engine out drift down. Thus the PF needs to decide between running the checklist, or commencing a drift down in anticipation of the thrust loss – or both. The determining factor is usually the margin above minimum manoeuvring speed – it’s a judgement call by the PF/Captain. Alternatively it’s given during climb with high thrust set on both engines. This reduces significantly the time before the onset of engine failure indications including further limit exceedences, engine/airframe vibration and more severe damage. You can’t run an engine for very long without oil pressure and the more thrust you ask of it, the shorter that time period is. It should be noted that in this circumstance one of the Engine Failure checklists (along with the associated memory items) is usually a more appropriate response to the failure than the annunciated ENG OIL PRESS checklist. In the simulator, the time between the EICAS message and the onset of engine damage is pretty dependent on thrust on the engine and is essentially formulaic – driven by simulator programming. If the failure occurs in the climb and climb thrust remains set – engine failure with the potential for engine damage comes soon(er). 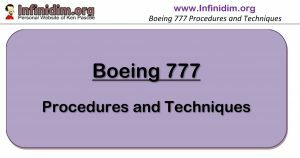 Once the engine indicates the conditions for Limit/Surge/Stall or Severe Damage/Separation, the PF should commence an Analysis (P&T 7.13 Engine Failure Analysis) and commence any applicable memory items. Don’t forget the Fly The Plane. Calling by memory for the Fuel Control Switch … Cutoff. Some instructors will frown upon this action, but it’s a legitimate call by the Captain of the day to make. This combination of Engine Limit/Surge/Stall and Fuel Control Switch secures the engine and prevents (further) engine damage when for some reason responding directly to the ENG OIL PRESS is not possible (why not?). The above is however a fairly complex response to a simple loss of oil pressure. It’s hopefully fair enough to say that the simplest response is probably to (a) fly the aircraft; and (b) run the checklist. If the aircraft is in a high thrust situation this can often be relieved quickly by the PF through levelling off and slowing down – without the need for running checklist memory items or checklist items by memory. Levelling off and slowing down (where possible) usually achieves the aim of reducing thrust on the affected engine enough to give you time to complete the ENG OIL PRESS checklist (at least to Fuel Control Switch … Cutoff) prior to engine damage.